MasterAPS is a secure application processing system (APS) that is fully-customizable to your data and team needs. With advanced data management, easy reporting and extensive connectivity, loan processing has never been easier. MasterAPS is a loan application processing system (APS) that makes lending cycles fully-automated. The intuitive interface also makes the credit process easier for every user — from front office staff to senior management. MasterAPS removes the hassles caused by paper-based workflows and email chains by saving all client data in a single profile, with each loan application and other supporting documents and information linked to the client profile. MasterAPS can even be linked with other internal and external data sources to obtain a richer pool of data. Configurable web-based appraisal forms work seamlessly with smart risk assessment tools to quickly and easily assess creditworthiness. MasterAPS also guards against input errors and ensures credit and operational risk levels are exactly as desired. MasterAPS was designed to make lending process faster and easier for both credit staff and clients, providing a higher quality of service while using less resources. BFC’s experienced team of credit and IT professionals provides support for the improvement of each step of the loan process, optimizing it to match organizational needs and system capabilities. Fill-in the form below to schedule your demo with one of our experts. MasterAPS is a loan application processing system used for credit cycle design, loan origination, borrower evaluation, data exchange, storage, and reporting — all in one easy-to-use application. MasterAPS lets you easily design any credit cycle. You can customize and manage as many different credit cycles as needed, ensuring that they are perfectly in line with your organizational setup and decision-making limits. 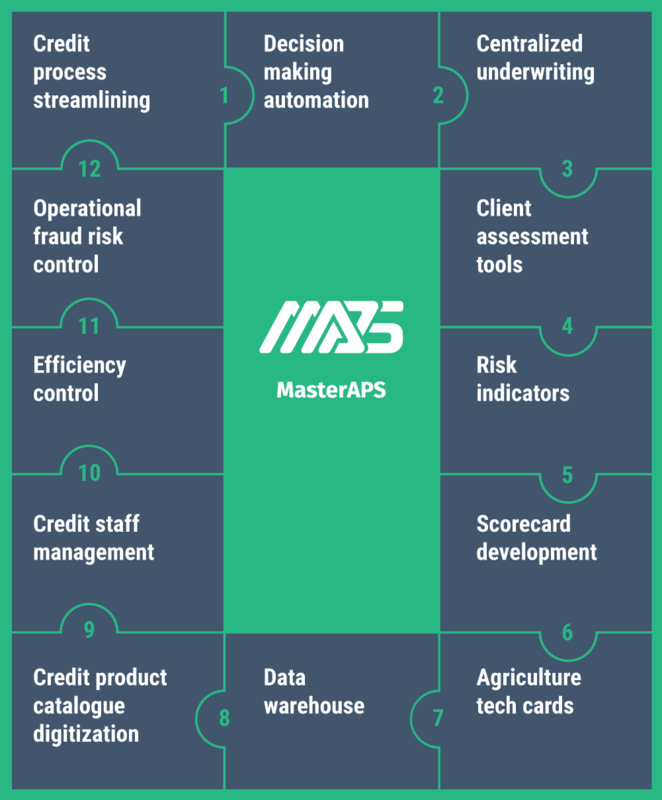 MasterAPS reflects your organizational structure and credit cycles, offering unlimited options to add users and manage their accessibilities. MasterAPS enables you to create and manage as many products and credit cycles as needed. MasterAPS supports the effortless design and management of credit forms, including customized input fields, data submission options from in the field and the creation of printable forms. MasterAPS can be integrated with your existing client database or can be used to build a new comprehensive database from scratch. 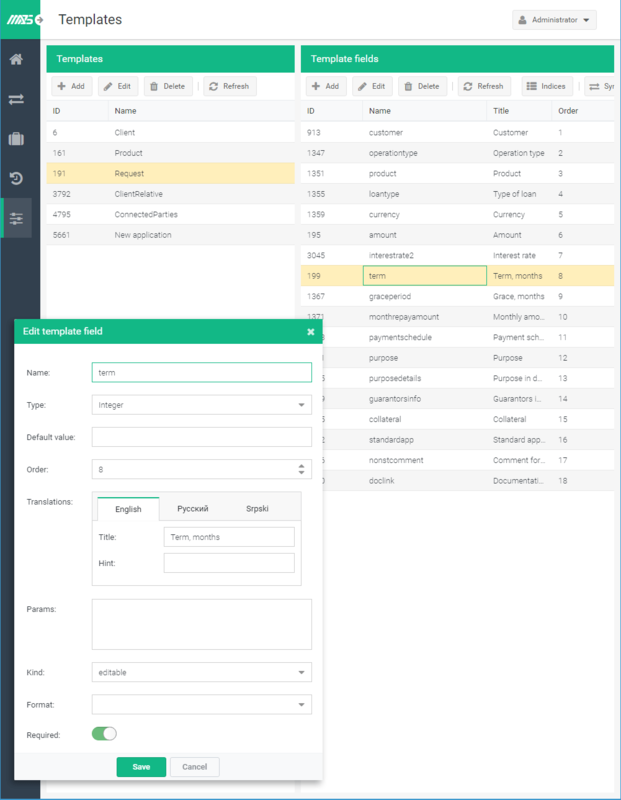 Users can quickly view applications (both active and archived) via user-friendly tabs that make it simple to access the entire application. Automatic email/SMS notifications also keep users up-to-date whenever the application status changes. MasterAPS can effortlessly evaluate client creditworthiness based on configurable specifications. MasterAPS includes a built-in configurable expert credit scoring form that enhances client appraisal and decision-making. MasterAPS also integrates with internal and external data sources to capture all relevant data necessary for statistical credit scoring. MasterAPS’s powerful reporting engine allows for one-click access to view key indicators such as processing time and disbursement statistics through standard pre-configured reports. 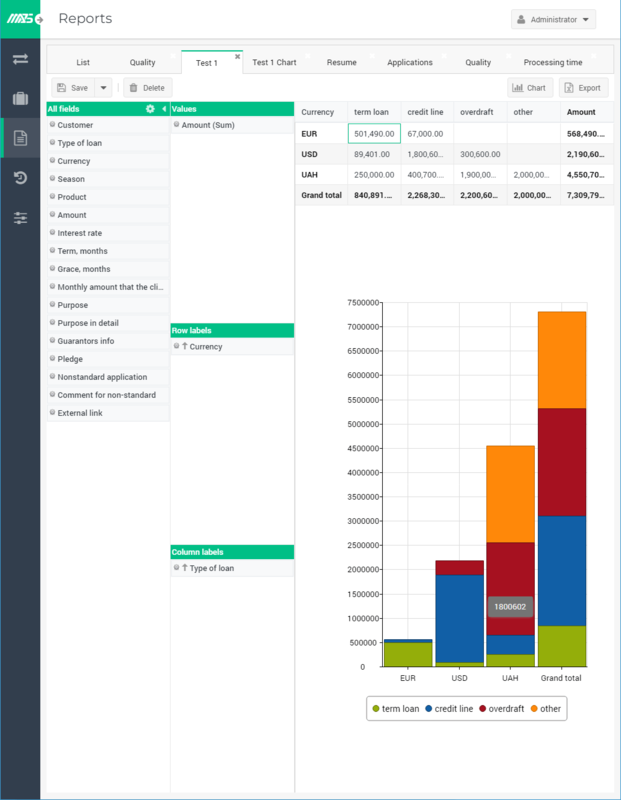 Additionally, the OLAP report builder allows for fully-customizable analytical reports to be created in just a few drag and drop actions. MasterAPS sends alerts when a fraud attempt has been detected. It also sends notifications for new loan application submissions and when an existing loan application status changes. BFC’s APS, with its variety of built-in and customized reports, provides us effective control over sales force results and efficiency, operational activities, and decision-making statistics. Moreover, we are now in a position to collect and store all financial and non-financial data for a challenging client group. A huge and valuable database was already collected within one year of using BFC’s APS. With BFC’s APS we have optimized our decision-making process, reshaping it and easily moving from a fully centralized model to semi-centralized. After implementing BFC’s APS within our standard decision-making process, we managed to reduce processing time by 30%. 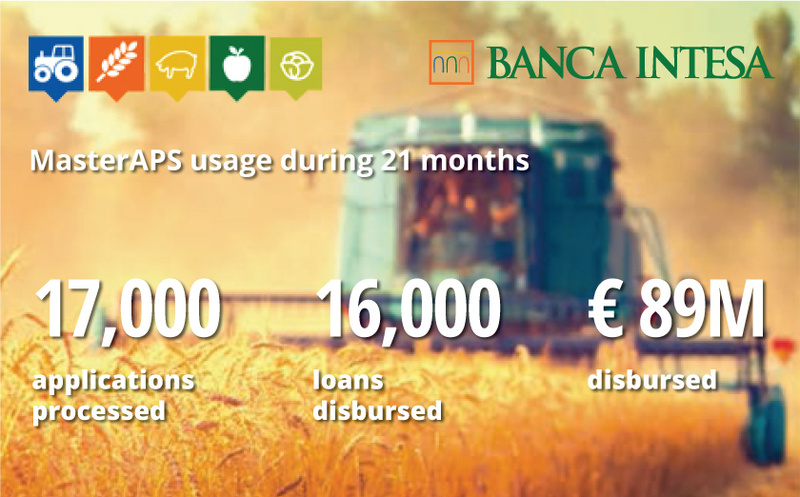 With partial decentralization of the process through BFC’s APS we expect to reduce it by 50%. Learn how a leading Serbian bank more than halved loan processing and approval times thanks to BFC’s MasterAPS loan origination system. Can MasterAPS be used as a core banking system? MasterAPS is a separate module used for efficient credit cycle management. It could be easily connected to any core banking system. Is it possible to manage document workflow by transferring and saving files in this software? Yes, MasterAPS features transferring and saving of any type of file. Can a loan agreement be automatically generated in MasterAPS? Yes, the system is capable of generating adjustable printable forms (e.g. loan applications or loan agreements). Does MasterAPS have any built-in reports? MasterAPS has built-in reporting tools based on the Online Analytical Processing (OLAP) engine, which allows for fully-customized reports. Does MasterAPS have any tools to evaluate the creditworthiness of borrowers? Yes, MasterAPS has a built-in configurable credit evaluation form that allows financial institutions to perform financial analyses of borrowers. Can MasterAPS be used on mobile devices such as smartphones, tablets etc.? Yes, MasterAPS can be used from any mobile device supporting a browser (subject to internet connectivity). Android and iOS apps capable of working offline are coming soon. What is the maximum number of users allowed under a standard MasterAPS license? The number of users and business roles is unlimited. Is there a maximum application flow or loan portfolio size that MasterAPS is capable of supporting? There are no such limitations. 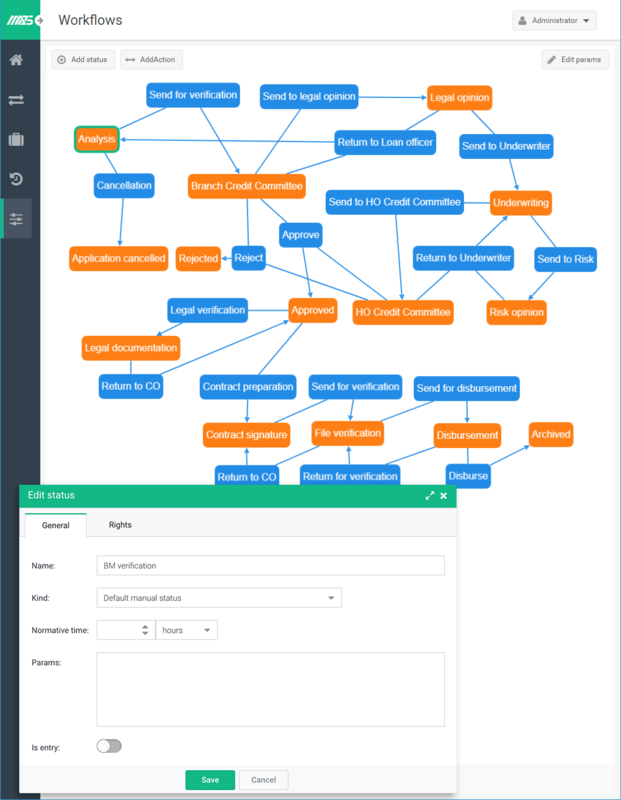 How many loan products and different workflows is MasterAPS capable of handling? There is no limit to the number of loan products and workflows. Is it possible to connect MasterAPS with external data sources (e.g. a credit information bureau or core banking system)? MasterAPS is capable of online connections with a credit bureau, a core banking system or any other database with available APIs. Does MasterAPS have a specialized client interface that allows customers to apply for a loan online? MasterAPS features roles for all bank employees who are engaged in the credit process. A separate module for clients can be developed upon request. The system can be made available as a secured SAAS service (i.e. the client doesn’t need a server). Alternatively, software can be installed on the central server of the financial institution. In either case, users access and use the system via a web browser. How long does it take to customize and install MasterAPS? It depends on the complexity of the custom settings and the specific requirements to integrate MasterAPS with other software and external databases. Typically, the implementation process lasts 2–6 months. If we purchase MasterAPS and later need to modify or add new loan products, roles or users, how quickly can these changes be made? BFC transfers all necessary documentation and trains your system administrators to easily make such adjustments to MasterAPS. Alternatively, BFC can provide the relevant support based on a separate maintenance agreement, if desired. MasterAPS is not available in a language we need. Can MasterAPS be customized to any other languages? Yes, MasterAPS can be easily customized to any language within a very short period of time. What support services are included with a MasterAPS purchase? Unlimited bug fixing and maintenance is free of charge for the first 6 months after system implementation. Following this period, it is recommended that clients subscribe to a maintenance service. What type of maintenance service contracts are available? Yearly service packages including unlimited maintenance and bug fixing as well as a fixed number of development days dedicated to the development of requested customizations. 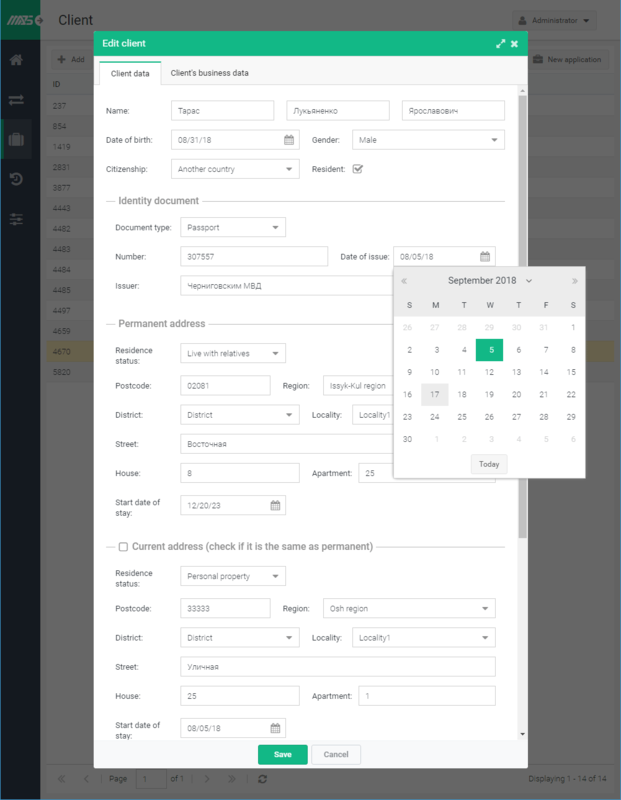 Alternatively, a pay as you go service is also available under which charges are based on expert time spent completing the requested actions. What guarantees are given on quality of support services? BFC guarantees a response to all reported key issues with the system within 1 working day. Feel free to ask any other question you may have; one of our experts will respond to your questions directly. We’d love to learn more about your needs for a great MasterAPS experience. Complete the short form and a MasterAPS expert will contact you directly to answer all your questions. We would be happy to show you all the features of MasterAPS in a live demonstration, answer any questions you may have and/or consider any proposal for collaboration. Simply fill out this short form and an expert will be in contact shortly. MasterAPS is a product of Business & Finance Consulting (BFC), Swiss-based firm engaged in financial sector consultancy in emerging markets. BFC has exposure in 70 countries worldwide and works with international financial institutions and donors as well as public and private sector clients. For more information, visit bfconsulting.com.